Three miles from Macclesfield lies the ancient and beautiful village of Prestbury, so called from the Saxon-Preost-burgh - meaning "Priests' town." The black and white timbered building which faces the parish Church of St. Peter with its Norman Chapel is the old Priest's House. Tradition says that the Vicar was accustomed to address his parishioners from the balcony during the time of the Commonwealth when the Church was closed to him by the Puritans. The house is now a branch of District Bank Ltd.
Further down the village street by the bridge over the River Bollin, a stream rising in the Cheshire hills, stands the Bridge Hotel, a famous hostelry dating back to 1626. In 1962 an unforeseen turn of events had a direct bearing on the picture for that year. 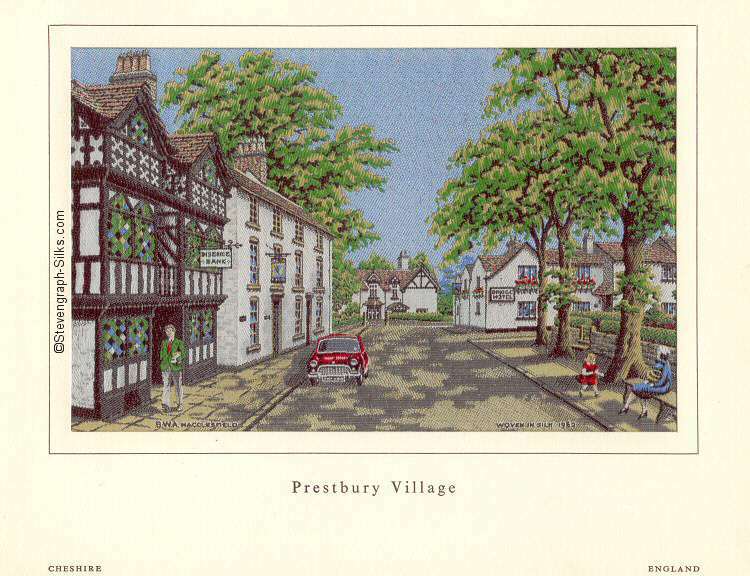 PRESTBURY VILLAGE was the chosen subject and was produced with a red Mini car in the road outside the then District Bank. At that time BWA were negotiating with Fords of Dagenham to produce a woven figured fabric for their car seats. It was realised, however, that it would be neither diplomatic to send them a calendar depicting a rival car nor would it help their case. The 'run' was stopped whilst alterations were made to allow the picture to appear with no car on view. Both versions were made available to the public, but generally the one featuring the red Mini [above] is more sought after. In both cases the technical details are identical.